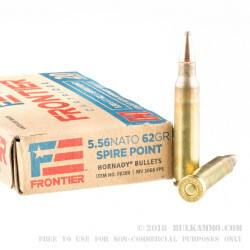 Hornady's Frontier brand of ammunition offers distinctive 5.56mm and .223 Remington loads for all practical applications. 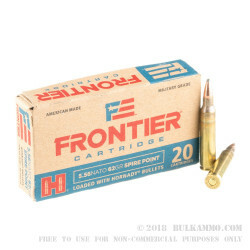 These particular cartridges are ideal for varmint hunting and self-defense use due to their 62-grain spire-shaped soft point projectiles; this weight matches the ubiquitous M855 profile and will stabilize steadily from the widest range of barrel lengths and twist rates while easily following well established zeroing tables and drop compensation reticles. The spire-point shape resists drag in flight while the soft nose facilitates massive expansion in a target in order to create a large free-bleeding cavity and to send body-stopping momentum into vital areas. 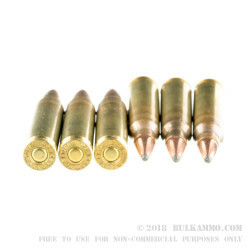 Hornady uses the latest in modern machinery to load each bullet into a reloadable brass casing that has been properly annealed for neck and shoulder strength. 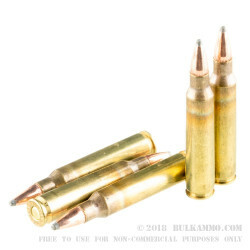 The projectile's ribbed crimp point prevents the loss of accuracy and reliable ignition which could be caused by recoil and setback while locking the bullet's copper jacket to its core for appropriate penetration after impact. Each brass case is filled with clean-burning powder and fitted with a military-style Boxer primer that is free from corrosive elements. Military primers are harder and guard against inadvertent ignition from free-floating firing pins like those found in AR-15 style rifles. Hornady has been around for close to seven decades and is one of the most trusted manufacturers in the United States thanks to their infallible projectile designs and affordable finished loads.